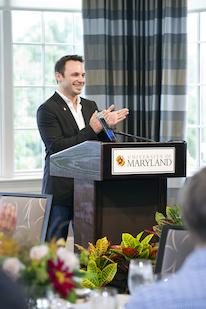 The University of Maryland announced today a gift of $31 million from Oculus co-founder and CEO and UMD alumnus Brendan Iribe – the largest gift in the university's history. The majority of the gift, $30 million, will help fund construction of the Brendan Iribe Center for Computer Science and Innovation, a new computer science building designed for cutting-edge work in virtual reality, augmented reality, computer vision, robotics and future computing platforms. 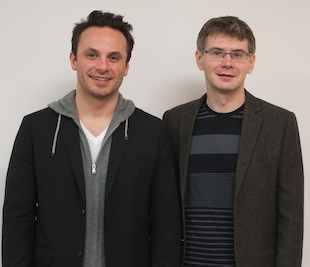 The remaining $1 million of the gift will establish the Brendan Iribe Scholarship in Computer Science. "The University of Maryland was an inspiration for me, and the relationships I made there have lasted a lifetime," says Iribe. "I’ve always wanted to give back to the school and public education system, and I hope this building will shape the future of computer science students at the university. The space is designed for hackers, makers and engineers, which will help give rise to future breakthroughs, products and startups that will transform the way we live and interact with the world around us." In addition, Oculus chief software architect and co-founder and 2003 UMD computer science graduate Michael Antonov is making a gift of $4 million to the university. Most of this gift, $3.5 million, will support construction of the building, and $500,000 will fund scholarships. An additional gift of $3 million from Elizabeth Iribe, Brendan’s mother, will establish two endowed chairs in the Department of Computer Science. "I've been passionate about computer science my whole life, and my experience at the University of Maryland fed that passion even more," says Antonov. 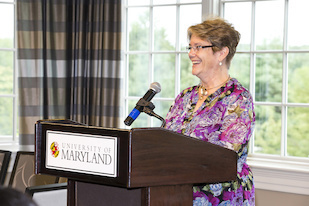 "My hope is that this gift will give UMD students access to world-class resources and facilities for computer science that enables them to achieve the seemingly impossible." The new, state-of-the-art facility will be a hub for cutting-edge computer science research and an incubator for technology and innovation. The building’s design encourages collaboration, with an emphasis on hacker/maker spaces and team breakout areas. Specialized labs will support groundbreaking research in virtual reality, augmented reality, artificial intelligence, robotics, computer vision and human interaction. Students will have the opportunity to learn in classrooms designed specifically for interactive, collaborative and active learning. Hands-on training will successfully prepare them for the growing technology workforce. This gift will support the university’s growing computer science department, which recently ranked 17th in the Academic Ranking of World Universities and 15th in the U.S. News & World Report rankings of graduate programs. Undergraduate enrollment in the department has more than doubled in the past eight years to over 2,000 students and more than 200 students are pursuing graduate degrees. Brendan Iribe is one of the video game industry’s most successful serial entrepreneurs and an alumnus of the University of Maryland. He is currently the co-founder and CEO of Oculus VR, developer of the Oculus Rift virtual reality headset. Oculus recently made worldwide headlines when Facebook announced that it was acquiring the company for approximately $2 billion. The two companies are joining forces to create the best virtual reality platform in the world. In 2012, Brendan and his team launched a Kickstarter campaign to fund the creation of the Oculus Rift development kit, which still remains one of the top campaigns in Kickstarter history. Before Oculus, Brendan served as chief product officer of Gaikai, the innovative video game streaming company, until it was acquired by Sony Computer Entertainment for $380 million in July 2012. Prior to Gaikai, Brendan spent a decade as co-founder and CEO of Scaleform, the leading user interface technology provider in the video game market, which Autodesk acquired in 2011. Earlier in his career, Brendan worked as a software programmer, helping the Firaxis team develop the user interface for the award-winning Civilization IV video game. Brendan attended the University of Maryland in Fall 1997 and Spring 1998. Michael Antonov is a co-founder and chief software architect at Oculus VR, a company focused on bringing immersive virtual reality to consumers. After graduating from the University of Maryland in 2003 with a bachelor of science degree in computer science, Michael began his career in software development as co-founder and chief technology officer of Scaleform, which grew to become the #1 user interface technology provider in the video game market. In March 2011, Scaleform was acquired by Autodesk. Michael co-founded Oculus VR in 2012, where he leads the development of the Oculus Rift SDK for the PC. Michael Antonov is an expert in complex multi-threaded software architecture, computer graphics, programming language design and engineering management. Established in 1973, the Department of Computer Science at the University of Maryland educates over 2,000 undergraduates and 200 graduate students yearly. Its more than 50 faculty members have been recognized with membership in the National Academy of Engineering, fellowship in professional scientific organizations, National Science Foundation Faculty Early Career Development awards and Sloan Fellowships. The department, in conjunction with the University of Maryland Institute for Advanced Computer Studies, receives over $22 million annually in external research funding.